BBC NEWS | UK | Magazine | How do planets get their names? Nasa-funded scientists have found what could be the tenth planet in our Solar System. They've called it Sedna. So how do planets get their names? When astronomers at the California Institute of Technology plumped for Sedna, it was not a decision taken lightly. They named it after the Inuit goddess of the sea who, according to some versions of her story, was thrown into Arctic waters by her father. It seems appropriately chilly, as the team believes Sedna's surface temperature does not get above minus 240 degrees Celsius, because it can be up to 84 billion miles (130 billion km) from the Sun - 900 times further than the Earth. There is, however, some debate about whether the scientists actually have the authority to decide a name. The planets in our Solar System, and many of their moons and smaller minor planets, are named according to Greek and Roman mythology. Venus, for example, was named after the Roman god of love because it was considered the most beautiful planet. Mars was named after the Roman god of war because of its blood red colour. Announcing the name Sedna, Dr Mike Brown, leader of the research team, said: "We knew it could end up being the coldest, most distant object in the entire Solar System. "Early one day we decided it was appropriate to name any objects out of this region after Arctic mythology." Dr Brown suggested it should also be considered a "planetoid" rather than a true planet because it is so small - about 1,000 miles (1,700 km) in diameter. Regardless of whether the proposed name is any good, it must now go before the International Astronomical Union, whose job it is to decide officially what planets are called. Brian Marsden, an astronomer and secretary of the IAU's naming board, told one US newspaper it was a violation of protocol to announce a name and assume it would be accepted. He said: "Other members of the committee might vote against it because the name was brought forward in this manner." If the IAU opposed the name it would not be the first time astronomers had been overruled. Eighteenth century astronomer Herschel tried to name Uranus "Georgian Sidus" after George III, his patron. He was unsuccessful and the planet was eventually named by Johann Bode in 1781, after the father of Saturn. If the IAU's appropriate panel does agree with the name Sedna, it will be passed on to its Minor Planet Centre, for official use. 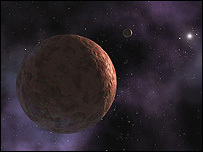 Until then, as widely used as the term Sedna may be, its official name will be 2003 VB12. The serial number comes from a system used by astronomers to denote the year, month and approximate date that celestial bodies are found. Despite the prospect of a row over the name Sedna between scientists and officials, Peter Bond of the Royal Astronomical Society believes there is a good chance it will be accepted. He says: "There are only so many names from classical mythology that you can have, so you need another source." Mr Bond adds that there is a move away from traditional names, to try to make astronomy more inclusive of all races and cultures. "The Earth is a planet which we're all on - floating through space - not just the Americans and whoever else has the technology to scan the skies." With many more minor planets, stars, asteroids and comets being found every week by astronomers, we can expect increasingly unusual names. "They have done something like 10,000 now, but there are thousands more that are still to be done," says Mr Bond.